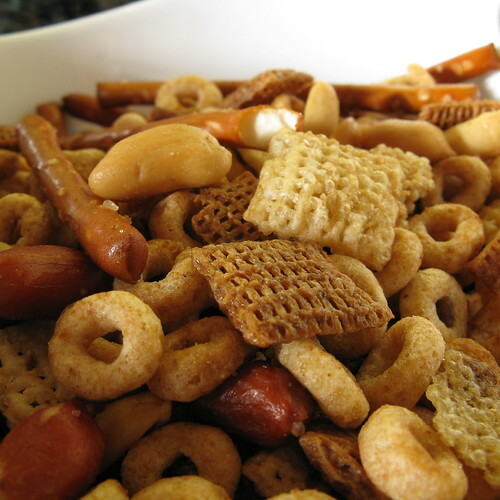 In my family we always have a bowl of Chex mix out around Thanksgiving & Christmas. I told my sister I would bring it this year. Now if you look at the Chex box they have all different versions but as far as I'm concerned the classic is the way to go. We think this mix is better if its sat for a day. In a large roasting pan melt butter over low heat. Stir in Worcestershire sauce & seasoned salt. Stir in remaining ingredients until everything is coated. Put pan in the oven & bake for 45 minutes stirring every 15 minutes. Two notes from my mom. She adds 1 teaspoon of garlic powder & 1 teaspoon onion powder with the to the melted butter as well as the other seasonings. She melts her butter with the seasonings in the microwave & then pours is over the mix in the roasting pan before putting it into the oven. I was talking with a friend about having these in our lunch boxes as kinds...still luv'em! I used to make a full roaster of these every year - always was gone before Xmas. I even added a bit of celery salt to the mix to give it extra punch.